Do you get a TON of scholastic book order forms that you don't use? Well, I get a TON. I wanted to do something useful with them, so I created this making connections activity to go along with the thousands of orders that I get each year. I am linking up with Freebies on the First. Click the picture below to go! All you do is link up your freebie that must always stay free and never be a paid product! I wanted to share with you what I am linking up today! My kiddos and I have spent an entire month making connections! We have been doing some super fun stuff with making connections, but this was by far one of the most hands on, and super awesome projects! 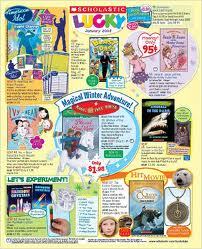 Do you have a TON of scholastic order forms laying around? I sure did and I thought, how on earth could I use them for making connections? 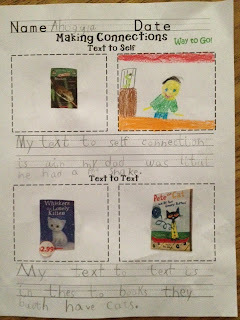 I decided to have the kids cut them out and glue them on paper and write their connections, both text to self and text to text! They LOVED looking through the magazines and finding a book they had a connection to. Many of the boys FINALLY got making connections because there are lego books of course! 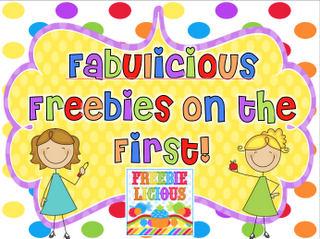 or you can click on the picture to go to my free tpt and download the freebie. Be sure to go over and join the party! Please be a follower, and also leave a comment! Cute idea! Thanks for sharing! I'm your newest follower!